At MBPT, you'll get the best in hands-on care. You may bring any referral to Mind Body Physical Therapy. 1. Call or email us - If you're not sure what to do or how to address your care, we'll answer any questions. 2. Schedule a free consultation - we'll thoroughly assess your situation and recommend an action plan. 2. Complete the patient intake forms online or in the office. 3. To your first appointment, bring radiology, surgery and/or MD reports if you have them (if not, we can get them for you), and your insurance card. 4. Wear comfortable clothes that can expose the injured area if needed. To save time, you may fill out these forms online, then email them, or print them and bring them to your first visit. Patient Intake Form - general information to get you started. HIPAA Notice of Privacy Practices - please read. HIPAA Acknowledgement - confirmation of receipt of notice of privacy practices. HIPAA Release of Confidential Information - authorization to use/disclose records if necessary. Back Index - information about how your back condition affects your everyday life. Neck Index - information about how your neck condition affects your everyday life. Exercise Record - monitor your regimen and your progress! It’s important to know that you may go to any physical therapist you choose. Medical doctors and hospitals will write you a referral that may be taken anywhere. If you don't make a specific request, they may refer you to their own physical therapists. However, you are free to bring that referral to any physical therapist you choose. Also, you don’t need to ask them to change to another pysical therapist, you may simply go. 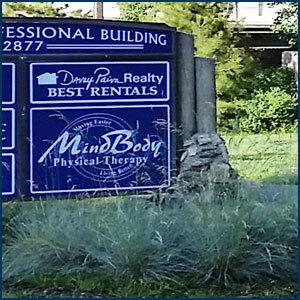 At Mind Body Physical Therapy, any referral is welcome anytime.